There are other things aside from vitamins that help with acne! Zinc is a mineral that is necessary for clear skin, but yet some people don’t know about it or aren’t getting enough zinc in their diet. It is critical for proper functioning of the immune system, as well as having antioxidant activity.It is useful for all types of acne, from blackheads to pimples. Zinc is a non-inflammatory mineral, so it will not hurt your stomach, like some other minerals do. What are good zinc rich foods for acne? 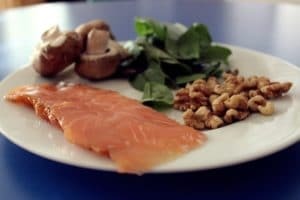 Enjoy a healthy meal with zinc rich foods like salmon, spinach, mushrooms, and nuts to improve overall skin health and even combat acne! Zinc is commonly found as a supplement, but it is also found in a variety of foods. The foods with the most zinc are seafood, beef, lamb, pumpkin and squash seeds, nuts, spinach, pork, cocoa, chocolate, and mushrooms. All of these foods have more than 100 grams of zinc per serving. Zinc deprivation has bad long-term effects on your body, so you should try to eat zinc with at least two meals a day. What else does zinc help with? Zinc helps wounds heal, boosts energy metabolism, reduces the chance for many diseases like anemia, and helps the body maintain healthy collagen. It is also very critical to the proper functioning of the immune system. It has some antioxidant activity as well as a powerful anti-inflammatory activity.It is necessary for lessening the chance of getting skin conditions, taste or smell disorders,immune disorders, diabetes, and diabetic problems. Where else can I get more zinc? A multi-mineral complex would be great since they are all important in maintaining your skin’s health. To learn more about nutritional supplements for acne, please call 602-505-3812 or book your appointment online.